We probably all know that a runny nose doesn’t usually mean that there is anything seriously wrong with us, but it can still ruin our day. Most people don’t take to their beds when they get this symptom, but sniffling all the time and the nasal discomfort is really distracting. So why do we get this symptom? The more scientific name for a runny nose is rhinorrhea. It is most often caused by inflammation of the nasal cavity, and we usually get this symptom when we have certain allergies or the common cold. Although we may not realize it, there is a lot of mucus being produced in our noses all the time. In fact we are swallowing a lot of it, because the respiratory system produces about a liter of this stuff every day (that’s about one quart). This mucus in the nose serves different functions; it helps to trap dirt and dust, it moistens the epithelial tissue in the nose, and it also moistens the air that is entering our bodies thorough our nose. When we have an inflammation of the nasal cavity there is increased production of mucus and nasal tissue and blood vessels become congested; it is this that we feel when we have a runny nose. Our bodies do an impressive job of dealing with all the mucus that is normally produced, but when there is too much production it just can’t cope. When we have rhinorrhea we might have different colored mucus if we have an infection like sinusitis. A runny nose might also come with the feeling of being all bunged up, or maybe you will just be sniffling all the time. Occasionally a runny nose might signal something serious. A head injury might cause a runny nose and so might ectopic teeth that have begun to grow in the nasal area. In most instances though, it will be something minor causing the problem. As well as colds and allergies you can also get a runny nose from; spicy food, dry air, cold air, drug addiction, bright lights, deviated septum, smoke, medications, hormone changes, asthma, perfume, and quite a few more things. 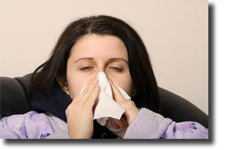 In fact there are so many triggers that can cause a runny nose it is a wonder that it every stops running. Many doctors will say that a runny nose doesn’t really need much in the way of treatment, and it will soon go away. It is up to your medical professionals to find out the cause of your symptom so as to rule out anything serious. You should always get professional medical advice, and you must certainly go see a doctor if you have the symptom for more than ten days, or if it is green mucus and you have a fever. A baby with a runny nose can develop difficulties breathing so they should see a doctor. When you have the symptom you just want to escape it and luckily there are things you can do to alleviate a runny nose. If your allergy has been caused by an allergy then antihistamine medication can make things more bearable; although a lot of these types of medication can make you a bit drowsy. Sniffing and swallowing will help, and if your baby has a runny nose you should use a rubber suction bulb so as to gently remove the mucus. Increasing indoor humidity and drinking plenty of fluids can help with thick mucus. Nasal sprays may give some relief in the short term, but over time they can actually make things worse if the irritate the nasal cavity too much. So hopefully you now know a bit more a runny nose, and you will know what to do the next time you have rhinorrhea.